Frozen yogurt bars are all the rage these days, and one day while at one I got the idea of doing an ice cream bar for her birthday party. It turned out very well, and was a lot of fun. To simplify things I decided to have only vanilla ice cream. Then went with a variety of toppings. I found the little ice cream sundae cups at a local party store. It was less than $2 for a package of 12, and they worked perfectly for the toppings. 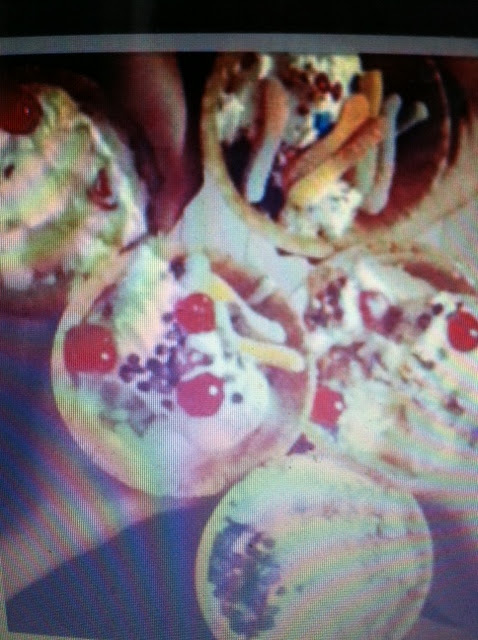 Our topping choices were sprinkles, cherries, walnuts, almonds, mini M&Ms, mini chocolate chips, jelly beans, crushed cookies, coconut, sour gummy worms, bananas, strawberries, chocolate and caramel sauces and whipped cream. I dumped the ice cream into the glass bowls to make a more attractive display. They may have been around forever, but I'd never seen them before. So much easier than a waffle cone, and so much more fun than plastic bowls. Instead of getting a traditional cake to go with the ice cream, she decided on cake pops. I was trying to figure out a way to display them, besides simply putting them in a jar or vase. I decided to buy a styrofoam ball, and stick them through that. I found one at Hobby Lobby that was already cut in half, so that worked perfectly. I used an ice pick to make the holes first, and then pushed them through. She was wondering how she was going to have candles to blow out, so I thought I'd just stick those into the ball, too. I had thirty cake pops, and I thought those would completely cover the ball. Surprisingly, I was wrong. It ended up with quite a bit of the ball still showing. Next time I do this, I will paint, or otherwise cover, the ball first. I would have painted this one black or hot pink if I had known it wouldn't be completely covered. It was a fun party, and everyone enjoyed being able to design their own ice cream sundae creation. It's an idea I may use again sometime! Especially perfect for summer time parties. i LOVE this ice cream sundae table idea. I'll definitely need to use this!! this looks so cool! did you provide other food/snacks for the party or was it just icecream?